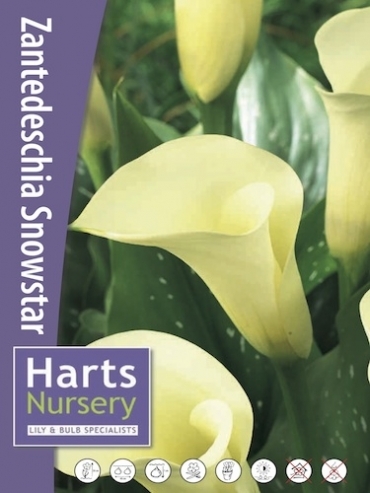 Zantedeschia 'Snowstar', will bear narrow, lance or funnel shaped flowers and are particularly effective when grown in groups within a border, or planted in pots and spread out on the patio. Top size tubers supplied. Zantedeschia (also known as Calla Lilies) is ideal for planting in containers for houseplants or for seasonal outdoor bedding displays. 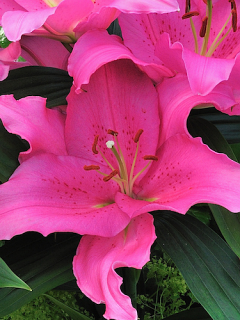 When planting, use a loam-based compost like John Innes No. 2. Plant just under the surface of the of the soil with the eyes of the rhizome facing upwards. Water freely throughout the summer months and feed with a fertiliser every two weeks. In most areas, the foliage will be hit by frost and slightly blackened. This should be cut away. Lift Rhizomes before the first frosts and store them over winter before replanting them next Spring (after the risk of frost has passed). Store Rhizomes in trays of compost in a cool, dark, frost-free location, e.g a garage, shed, warm greenhouse or conservatory.